Hi all, have just finished my new hi-viz mast, I need it as I do some running about in the dark winter evenings in my C5!! Do you want to try again? There was a problem with uploading files which has been fixed. Cheers for that Dan, goes !! Cheers lads, just have to say I can't wait to get your disc brake kit once testing is complete, the latest pics look great and sounds like testing has gone very well so far, brilliant!! Yes, they are LED's, they are self adhesive strip LED's, the mast is home made and not an original. Have you thought of doing these as a kit? We would be interested. Would like to nominate kamztrad for some medals for helping me with the temp gauge and this excellent light system. Anyone thought about brake lights? Aye he does deserve a medal for creating this. A project medal and an A++++ medal Keep up the great work kamztrad! 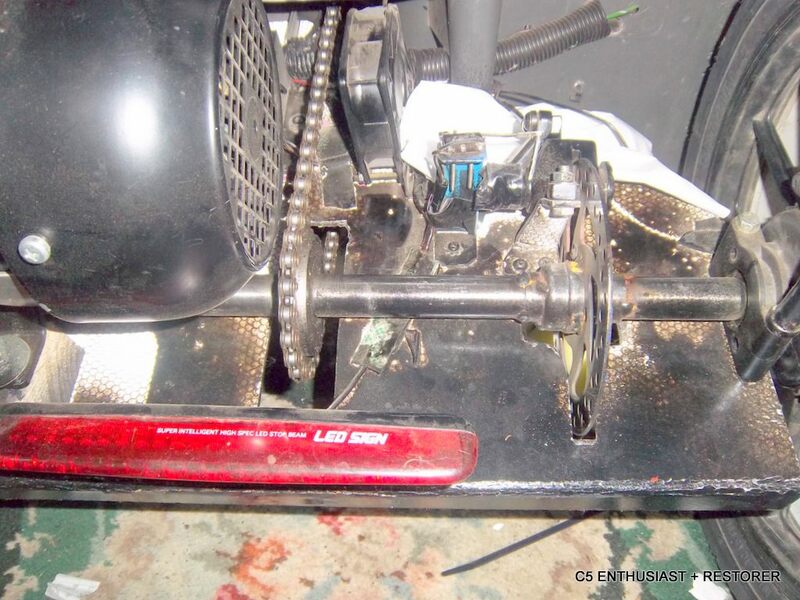 Brake lights would be a brilliant idea, especially now some C5's are having discs fitted. Perhaps a high viz mast looking like an original item with brake lights fitted. 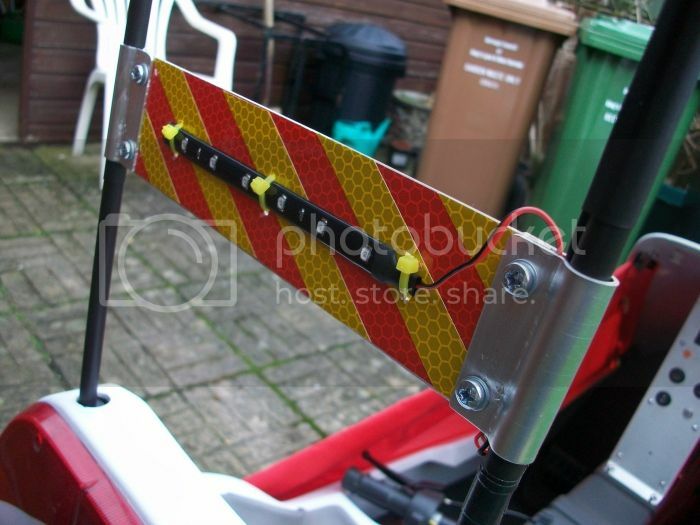 Some interesting idea's, certainly it shouldn't be too difficult to fit a rear brake light with associated switch and Chas has already done this, the lights I have fitted are fixed to some pieces of sheet aluminium which are bolted to clamps made of the same sheet which are a tight fit onto the poles. I haven't thought of doing it as a kit as it took me quite a while to fabricate this one, but I will gladly post some pics showing the mast and how it's made, I'll take some pics during the day so you can see it more clearly. 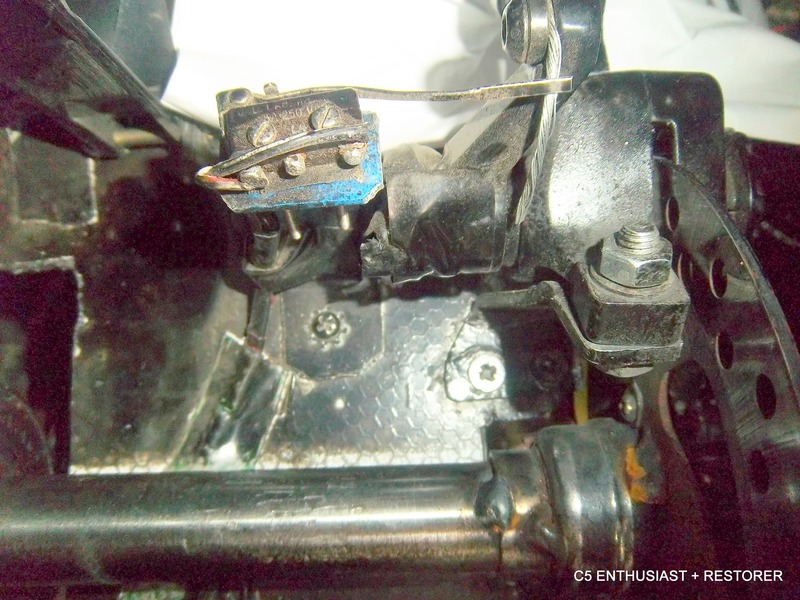 The lights are just wired in parallel to the rear light, and the wire from the mast plugs into the jack socket I've fitted into the body - more pics to follow in the next day or two. Chas any chance of some photos of the brake switch on the batmobile? 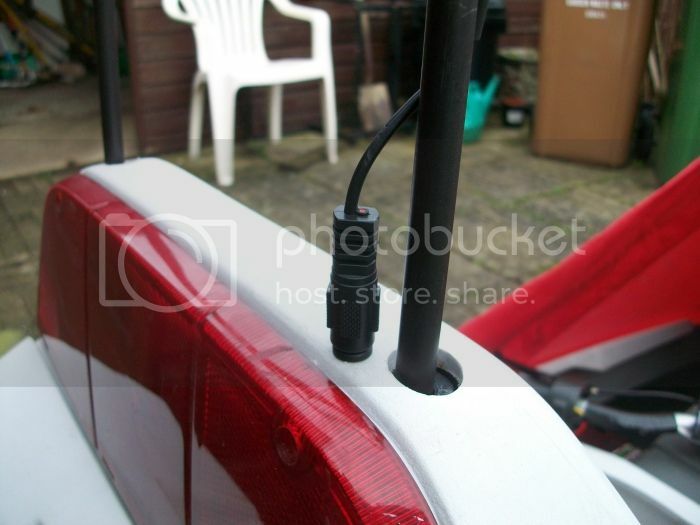 Just kicking ideas around for a brake light,thought of a reed /plunger switch mounted on the front brake lever bracket and a rear motorcycle brake switch fitted to the caliper actuating arm on the rear,wired together so the light comes on if either or both brakes are used.Thoughts anyone? I'd certainly be interested too, sounds like a good idea. I d also be interested but like everything depends on cost. 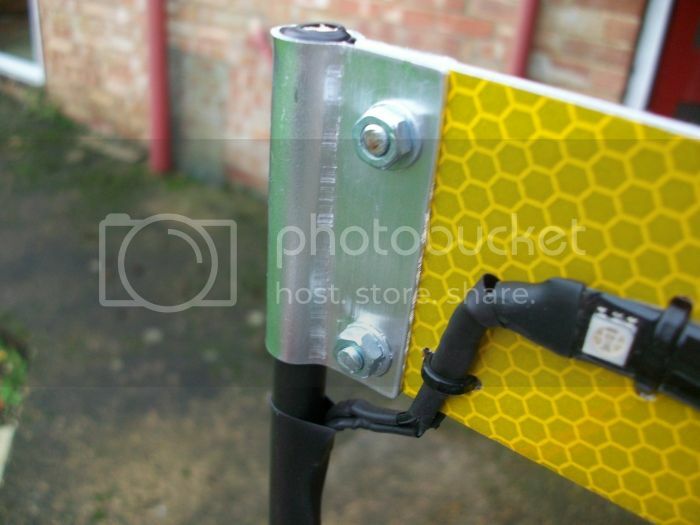 Just thought I'd pop a couple of photos of my home made Hi Viz mast on - the poles are 9mm wooden dowel covered with heat shrink, the panels and brackets are just sheet aluminium folded around the dowel in a vice and bolted together. The wiring is a bit crude but it works, and I've fitted a jack socket and plug for the electrical connection which makes it quick and easy to remove it the mast needs to be taken off. 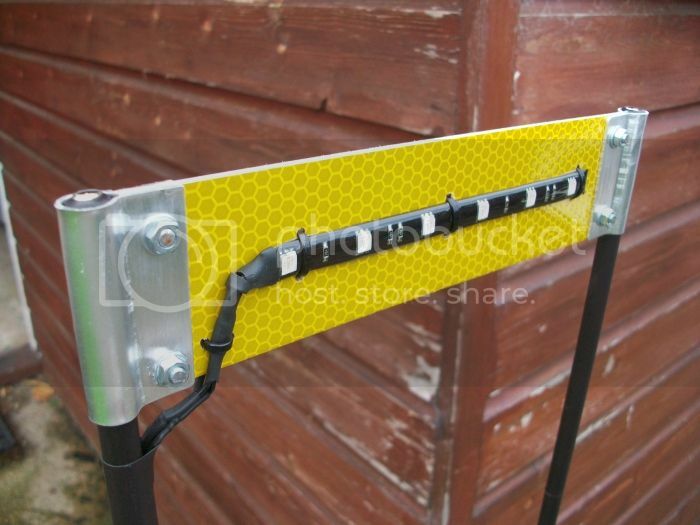 The LED strip lights are self adhesive but are also fastened with cable ties through the panels. The mast is not designed to be strong, but it is light and easy to remove, and has proved to be quite noticeable, especially at night. I was thinking the same thing, perhaps using the lower or the 2 rear lights as a brake light - just waiting for the rear brake mod and perhaps a brake light switch if Chas can devise something, I'm sure he'll come up trumps as usual!! That's something to print dan ?